Tingley is leading the fight by anglers against bringing small salmon from New Brunswick to waters near the Medway River. "Up to a million fish in one area, and there’s pollution, disease and the ruination of the ocean floor through the feces and the waste of feed going there. 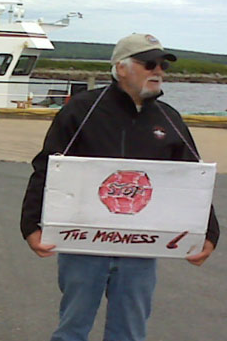 This has an impact on the lobster fishery, the shell fish harvesters," Tingley said. There has been an ongoing debate over the impact of fish farming or aquaculture in Nova Scotia. The problems with the transfer – and the fish farms – could could be escaped salmon and the transfer of pathogens in the water from New Brunswick. It is thought that both sea lice and the ISA virus are transferred to fish via the water in which they swim. “If farmed salmon get into the Medway River system, that will be the end of the wild fish," Tingley said. His concern is that the farmed fish will spread parasites and interbreed with wild fish in the Medway River. Tingley said the fight is not over. The Nova Scotia government recently approved two salmon farms in St. Marys Bay in the southwestern part of the province each farm will stock about 700,000 fish and is part of a $150-million expansion by New Brunswick-based Cooke Aquaculture. The farms will total about 84 hectares.